Hot tub water care is the most important maintenance issue for spa owners. 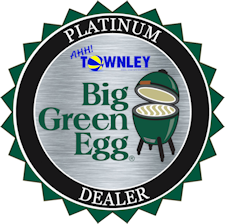 You’ll find products to help you solve common problems at Townley Pool and Spa. Don’t forget, you can also bring a water sample to our store, and we’ll test it for you. Then, we’ll print a computerized report to help you get you the right products to properly maintain your water. In a spa, you add sanitizers to control the growth of bacteria and algae. The warm water environment of the spa is conducive to growth, making sanitization essential to having a clean spa for bathers. Although the chemical reactions that occur to sanitize a spa are the same as in a pool, the reactions in a spa happen at a much faster rate. Chemicals become more reactive and tend to be used up more quickly than in a pool, requiring frequent chemical additions to maintain proper sanitizer residuals. No, shocking should be part of your regular spa maintenance. While it does help with troubleshooting, routine treatment helps provide the correct chemical balance your spa water needs to keep the water clear, odor-free and comfortable. 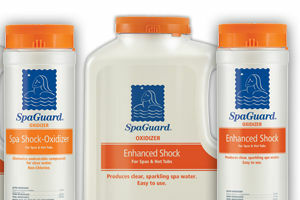 Shocking should be done weekly in most spas and more frequently for heavily used or commercial spas. 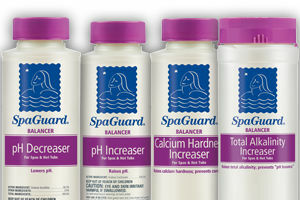 Balancing your spa water is necessary as balancers control scale, adjust pH and total alkalinity and correct mineral imbalances. Prepare yourself for a special spa experience with Soft Soak, SpaGuard’s bromine-free, chlorine-free spa care system that only requires your attention a few minutes a week. Soft Soak provides a wonderfully soft, soothing and gentle spa environment. 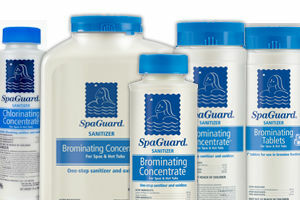 Yes, chlorine and bromine are not the only sanitizers that can be used to treat spa water. Biguanide is also an effective sanitizer that kills bacteria while keeping the water soft. Biguanide doesn’t degrade with sunlight, temperature, or affect pH like traditional chlorine sanitizers can. This means easier use! TRIO was made for the spas that hold 350-450 gallons of water, and it’s highly recommended for new spa owners.